– So, what’s the problem? …If a building has to work like a machine, it should look like a machine, right? [*] If you don’t think it’s a joke, then you’re part of the problem. The original cartoon can be found as originally published in the “Klaus Kube” section of Uncube Magazine #21: Acoustics, edited by Sophie Lovell, Florian Heilmeyer, Jessica Bridger, Elvia Wilk et al., and even features a rare recording of Pink Floyd’s Intro to “Obscured by Clouds”, played to an article. 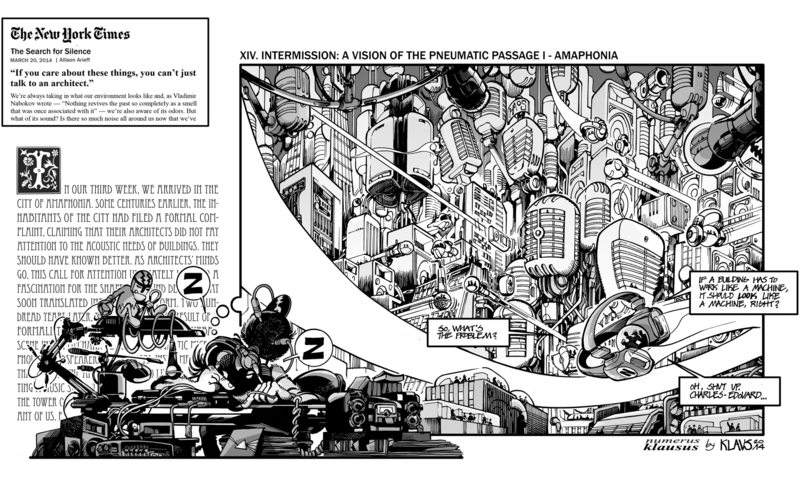 The Pneumatic Passage is a project located somewhere between Les Cités Obscures, The Airtight Garage, and Le réveil du Z, which has been in the pipeline for a long time -and will be till I find some funding. More on that later. Cartoon for The New City Reader issue VII: Real State, with contributions by Peter Tolkin, Mabel O. Wilson, Carmen Argote, Chloë Bass, Brigette Borders, John Cantwell, Catherine Ingraham (not this topic, this time), Marisa Jahn/CUP, Olalekan Jeyifous, Alexandra Lange, Elizabeth Lasater, Zoe Malliaros, Mitch McEwen, Minna Ninova, Daniel Payne, Alan Rapp, Cassim Shepard and Matthew Vaz. Available since November 19 at the New Museum. A peek at the cover and contents here. The above is a (slight variation on a) cartoon just published in the Fall/Winter issue of New York- based, Carlo Aiello-directed eVolo Magazine. Other than the cartoon itself, the magazine focuses, under the title “Cities of Tomorrow”, on recent works by Arup Biomimetics, AS/D, BIG – Bjarke Ingels Group, LAVA – Laboratory for Visionary Architecture, MAD Architects, Matter Management, MONAD Studio, NH Architecture, Rojkind Arquitectos, SOFTlab, Ted Givens, Terreform One, Trahan Architects, UNStudio, Vincent Callebaut, Will Alsop or WOHA Studio among others. Of course, all these are just an excuse to publish the cartoon (magazines usually require a certain minimum amount of pages to be considered as such), but the editors disguised it so well that it’s impossible to notice. You may want to check the complete list of featured works here. EVolo also launched their 2011 Skyscraper Competition. Registration and submission will be open till January 11, 2011. A preview, with the article “Lincoln Road: Envisioning Infrastructure Sensuality” on MONAD Studio’s Lincoln Road Capacitors Project written by Eric Goldemberg can be found here. UPDATE: Below you can find the cartoon in its original context as a companion to the article API – AR 2050, by John Hill, creator of A Weekly Dose of Architecture and its sister website A Daily Dose of Architecture. You can read it by clicking on the images or download them in .pdf form here, by courtesy of Carlo Aiello and John. 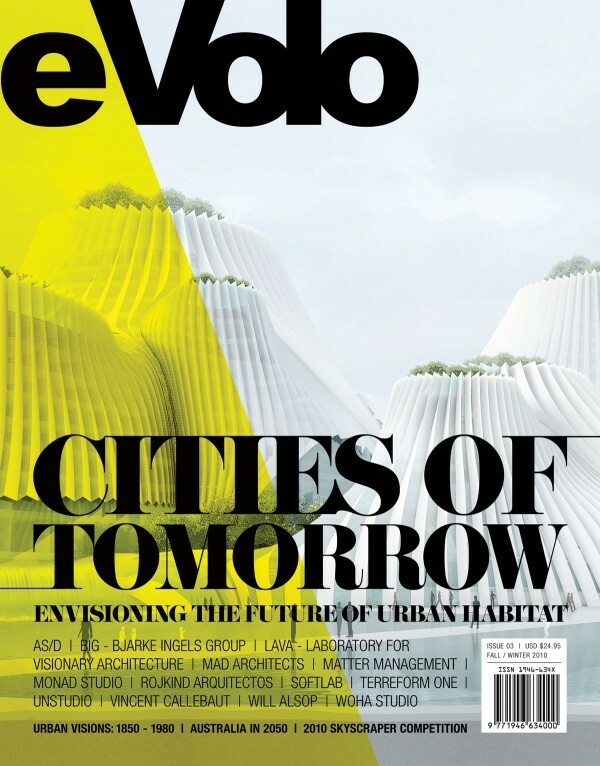 eVolo 03 – Cities of Tomorrow. How do we imagine the cities of tomorrow? This is one of the most difficult questions that architects, designers, and urban planners need to answer in a time where more than half of the world’s population lives in urban settlements – a mere century ago only ten percent did. This issue examines innovative urban proposals that will transform the way we live; projects that preserve the natural landscape with integral architecture and urbanism with deep connections to site, culture, and environment. These are concepts of hybrid urbanism that offer a juxtaposition of programs to live, work, and play for a hyper-mobile population.